In the late 17th and early 18th Century, the Sicilian instrument builder Carlo Grimaldi was considered one of the finest in Italy. Besides harpsichords he also manufactured organs and lutes. Only 3 of his instruments have survived, one of them being the 1697 harpsichord that is available in Germanisches Nationalmuseum in Nürnberg, Germany. Typically of Grimaldi's harpsichords, it is a thin-case, natural-wood (Cypress) harpsichord set into heavy, painted, protective outer case. The inside of the lid is painted with a mythological landscape. The range is G0 to C5 (57 notes), 250 cm length. The instrument has been copied numerous times for use in recordings and live performances because of its handsome graceful shape and its wonderful singing tone with rich and clean bass, appropriate for continuo playing, accompanying, and for the Italian and German solo literature. 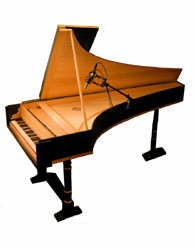 A physically modelled copy is available as a free add-on to all Pianoteq customers as part of the KIViR project.